A boiler is a radiant heating system and a furnace is a forced-air heating system. 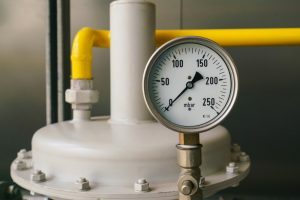 While a boiler isn’t the only type of radiant heating system and a furnace isn’t the only forced-air heating system, they’re definitely the most common type of heating system in each category and the main two we’ll talk about in the rest of this post. Radiant heating means that forced-air via ductwork isn’t used to circulate the heat within your home. Instead, water is typically used to distribute the heat through piping in the walls or floorboards. When you’re specifically referring to this type of heating it’s sometimes referred to as “hydronic heating.” The most important thing to understand about radiant heating is that it warms you through certain objects in the room rather than warming the air as a forced-air heating system does. So what are the benefits of a boiler system? Boilers are hands-down more efficient than furnaces. This is largely because water conducts heat far more efficiently than air does—it absorbs heat faster and for longer. It’s also due to the way boilers distribute heat into a room. When a boiler emits heat into a room, it distributes it slowly and evenly while furnace systems tend to blast hot air into a room from one vent and this warm air all clusters toward the ceiling. We experience cold weather here in Staten Island and the intense heat of a boiler is perfect for our weather. You won’t find many HVAC companies on the west coast or even in the southwest offering boilers, and it’s for a reason—they’re made for colder temperatures like ours! The U.S. Department of Energy estimates that the average forced-air control system loses as much as 30% of its total output to leaks in ductwork. That’s because duct systems are susceptible to leaks and blockages by dust, dirt, and grime. You won’t ever have to worry about this with a boiler system because this system employs a network of piping that circulates water instead. If you’re interested in putting a boiler in your Staten Island home, contact Scaran.